The program of the seminary is designed so that as the candidate progresses through his training he is given more opportunity to exercise responsible freedom. Through this process he will grow in the realization of the need for authority and organization in the community of the Church. The following guiding principles and customary procedures are to assist the seminarian in his growth toward personal freedom and responsibility in service to God, Church, and neighbor. This is best exemplified by the seminarian’s familiarity with the various policies, procedures, programs, administrative structures and line of authority described in this handbook. 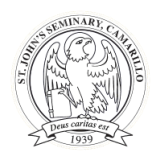 These general principles are the basis of the life of the one community that is St. John’s Seminary. They are to be understood as generative, attitude-forming principles that connect one’s life and actions to his vocational call. All members of the community accept, encourage and appreciate their own gifts and the gifts of others. Likewise, we all accept, encourage and appreciate ourselves and each other in our ministry of service to each other, which all now share. The good order of the community, as agreed upon by the members of the community, has, as its basis and purpose, mutual respect, trust and sensitivity for each other. This is achieved through responsible communication and action. Our community is governed by the principle of subsidiarity. All officers have chief responsibility for the administration, development and evaluation of programs under their jurisdiction according to the Principles of Administration. be available to others by his presence at the Seminary. Within the present situation of the many ministerial and social responsibilities away from the Seminary that each person has, it is important that all establish a balance, whereby they can form and grow from those important relationships with fellow members here in the Seminary community that will be beneficial for the rest of their lives. Each member of the community should be free to pursue his own personal formation and growth towards holiness in Christ, in light of the principles which the members of the community have established. As seminarians and priests, we are called to a life of service and holiness, which requires sensitivity to the needs and expectations of others who look to us as models of faithful Christian living. Accountability is a matter of personal responsibility in this life of Christian service. It is not a matter of mere docility to regulations and to the observation of supervisors and evaluators. Accountability means continual self-examination and an openness to give an accounting of one’s attitude and behavior. In order of precedence, accountability is given to oneself, to God, to the people of God and to one’s brothers and sisters in ministry, to one’s bishop or religious superior, and, finally, to those placed in authority. Accountability includes an openness to supervision and to fraternal correction. Hospitality towards visitors is an important part of the Christian life; members of the community should welcome visitors warmly. The primary visiting day is Sunday. Please see the Seminary Visitor Policy for guidelines concerning individual and group visitors.